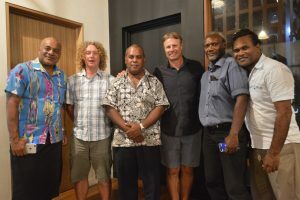 Australian rugby league legend Andrew ‘ET’ Ettingshausen has pledged to return to the Solomon Islands in 2018 after yet another successful visit collating footage for his hugely popular ‘Escape with ET’ fishing show. ‘ET’ and his crew visited Santa Isabel, Guadalcanal and the Florida Islands last week as part of a combined Solomon Islands Visitors Bureau (SIVB) and Solomon Airlines initiative aimed at promoting the destination’s ability to deliver a world-class fishing product. While in the Solomon Islands ‘ET’ and his team stayed as guests of Papatura Island Retreat and the Coral Seas Resort & Casino. Now in its 19th season, the ‘Escape with ET’ show is televised every weekend on Australian national TV Channel Ten to an estimated 350,000 fishing enthusiasts. The show is also distributed to more than 20 countries around the world.